Master Gardener plant sales present opportunities for area gardeners to acquire plants at very reasonable prices. 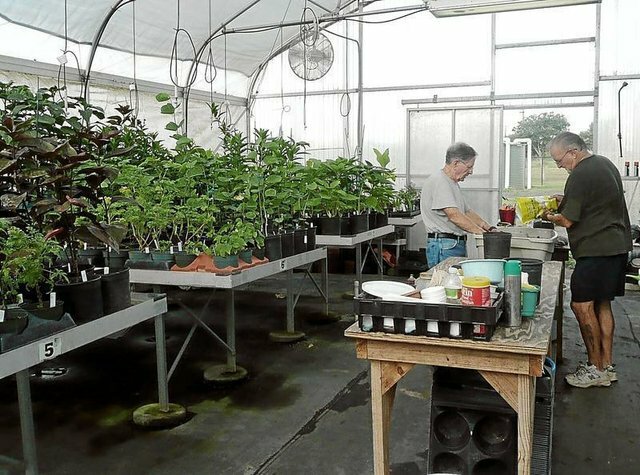 Most of the plants are provided by individual members or propagated by Master Gardeners in our own greenhouse at Victoria Educational Gardens (VEG). Some are purchased wholesale or provided from area growers and made available to buyers. All of the plants are known to be suitable to this area. On Sept. 14, the Victoria County Master Gardeners will host a full day's activities including a Children's Festival in the gardens in celebration of 10 years of VEG, an educational symposium with concurrent sessions morning and afternoon and the popular fall plant sale from early morning until sold out. Various plants have been propagated for the sale with many hours volunteered in individual gardens and in the greenhouse in preparation for the fall event. Growing and reproducing plants for our garden and sale has been a challenge to our practical and aesthetic sense as well as a reward for our developing knowledge, skills, patience and persistence in the face of initial and sometimes even repeated failure. I have often been disappointed and occasionally rewarded with success in creating new plants from cuttings, seeds, etc. Each failure should challenge you to further study and further try to achieve success. There are two forms of propagation: sexual and asexual. 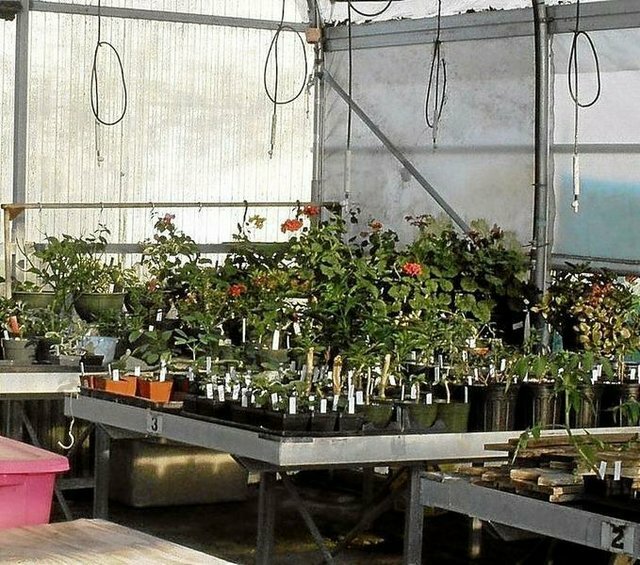 The former is mainly from seeds either bought or collected; the latter encompasses cuttings, layering, division, budding and grafting as well as tissue culture. All except tissue culture (a commercial technique for mass production) will be described with emphasis on cuttings in the greenhouse, a process available to all gardeners with simple tools and well described procedures. Cuttings are obtained either from the tip of a shoot or the shaft and should include four nodes if possible. They should be stripped of all but the top leaves, "stuck" in the appropriate media and kept in a moist, but not soaked container. They should also be kept in a warm (75-85 degrees) environment with indirect lighting. 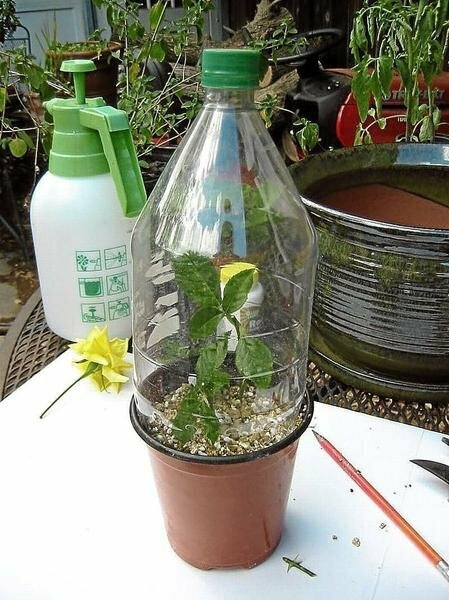 The "soda-bottle" greenhouse is a simple way to get started as illustrated in this article. • Appropriate media is usually considered 50:50 mixture of perlite and vermiculite for moisture retention and support. • Some plants do better in specific other media and some research may be helpful in improving your yield. • Success seems better by sticking multiple plants in the same container. • Using rooting hormone is often helpful and should be applied to the scarified end of the cutting (exposing the cambium layer) before sticking. This category includes simple stem layering, leaf cuttings, and mounding. In stem layering, the shaft is injured or partially broken, and a rooting hormone is applied before burying the shaft in soil near the plant. Air layering is done by injuring the stem, treating with rooting hormone and wrapping in a plastic cover with either moist sphagnum moss or the perlite/vermiculite mixture. African violets and begonias are especially responsive to these techniques. Division is often used in conjunction with transplanting to not only yield new plants but to relieve root binding in a potted plant. I have recently done this with a variegated oregano plant and lantanas with a favorable outcome. The plant is removed from the soil and simply cut across the crown leaving both stems and roots with each section. The individuals are then returned to the ground or repotted with a good potting soil. Budding and grafting are often used to shape older plants, and to graft onto rootstock that are more disease resistant (such as wine grapes and citrus trees). These really demand a separate discussion, and will not be described here in detail. 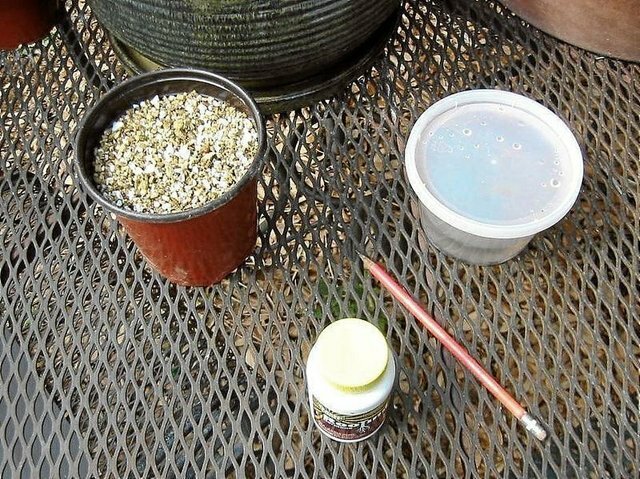 These techniques are part of the armamentarium of all Master Gardeners, and are well treated in our master gardener training courses. I hope this has stimulated your interest and leads you to further training through our program in the future. And I also hope this sparks your interest to come browse and shop the fall plant sale on Sept. 14 at the 4-H Activity Center on Bachelor Drive at Victoria Regional Airport. There will be plenty of help and advice offered by Master Gardeners along with other activities about gardening all along Bachelor Drive that day. • Stick multiple plants in the same container as they do better with "company"
• Rooting hormone applied to the scrapped end of the plant is often helpful to improve yield. Source: Victoria County Master Gardener James A. Grumman Jr.